Word is spreading fast that the creators of the Ursa-Major-nominated film Ted are facing a lawsuit. “The creators of web series about a foul-mouthed teddy bear with a penchant for drinking, smoking and prostitutes have filed a copyright infringement suit against Seth MacFarlane, Universal Pictures and the producers of Ted, the 2012 film about a foul-mouthed teddy bear with a penchant for drinking, smoking and prostitutes. Bengal Mangle Productions claims that Ted ‘is an unlawful copy’ of its own animated teddy, who was featured in two different web series, Charlie The Abusive Teddy and Acting School Academy. The suit, filed today in U.S. District Court in Los Angeles, states that those web series aired in 2009 and 2010 on You Tube, FunnyOrDie.com and other streaming websites.” Any merit to this? So far the targets of the lawsuit haven’t responded, but you can visit Charlie’s official web site and check things out for yourself. Seth MacFarlane and Universal Pictures have announced that the sequel to the wildly popular 2012 movie Ted will be released to theaters on June 26th, 2015. It’s simply called Ted 2. Once again Seth MacFarlane will direct and star as the voice of Ted, the foul-mouthed talking teddy bear, and Mark Wahlberg will reprise his role as Ted’s grown-up childhood human friend. That’s about all we know about it so far — other than the fact that the sequel will also be R-Rated! 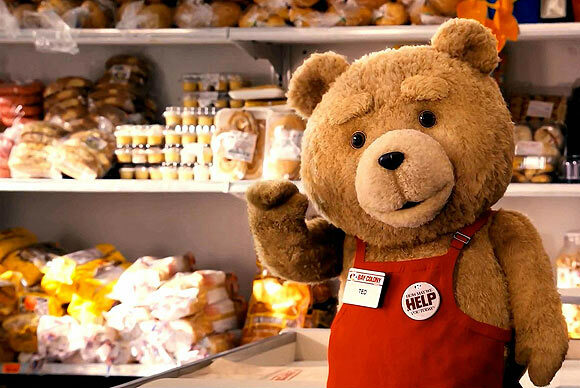 The original Ted, of course, was nominated for an Ursa Major Award for Best Anthropomorphic Feature. Seth MacFarlane, the man behind hit comedy series Family Guy and American Dad!, is set to direct Ted, a surreal comedy movie about "a man being forced to redefine his friendship with an anthropomorphic teddy bear that comes alive after his childhood wish comes true." Ted will star Joel McHale, Mila Kunis, and Mark Wahlberg. McHale will play Rex, a boss who repeatedly hits on his employee (Kunis). She in turn wants to marry her boyfriend (Wahlberg), who first has to deal with the anthropomorphic womanizing teddy bear who is ruining his life. The bear will be voiced by MacFarlane. 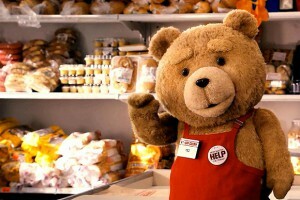 Ted, a Universal Pictures film, is expected to reach cinemas in 2012.